Two weeks ago I took a day trip with two friends to the Southern part of Korea. Our destination was Hadong, to attend the annual tea festival. 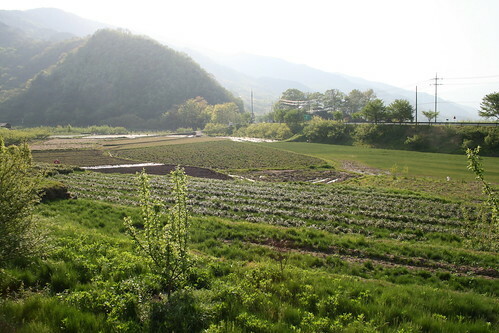 Hadong is the first place that tea was grown in Korea and is now well known as a prime tea-growing environment. 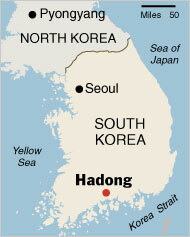 We boarded the bus from Seoul early Sunday morning and arrived early afternoon in Hadong. According to the tourism information and the Tea Festival’s website, there was a free shuttle bus from the Hadong bus terminal to the festival activities. This is probably a good time to talk a bit about travelling as a foreigner in Korea. Obviously, because of language barriers, getting accurate information can be difficult, especially outside of Seoul. However, the difficulties go a bit beyond the language issues. It has been my experience that often websites and maps are inaccurate. Often there is important information on the Korean version of a website that is missing from the foreign language versions. Or, if the information is there, the translations can be rather cryptic. Sometimes, the information turns out to be just plain wrong. All of this is ok, but it means that you have to be flexible with plans, and arm yourself with a sturdy sense of adventure and humour. So, back to the shuttle bus . . . As it turned out, the shuttle bus did exist, sort of. It was more of a regular city bus that cost 2.50$ Well, that was fine. After all, we didn’t travel for 4 ½ hours just to be deterred by a few dollars. On the bus we met a girl from Kansas who was just travelling around Korea. She had made friends with an older Korean man sitting beside her and he was very interested in all of the foreign girls. Thanks to some misunderstandings the man had some trouble with our names. I became knows as Peggy and my friend, Jenn, morphed into Eugene. We might have corrected him, if the new monikers weren’t hilarious. Instead, we called each other Peggy and Eugene for the rest of the day. (We tried to find a new name for Heidi, but nothing stuck.) When we were figuring out where the bus would stop it became apparent that the man was taking it upon himself to be the tour guide for all of the foreign ladies, a thought which underwhelmed us. So, upon exiting the bus we checked in with the girl from Kansas, who wanted to stick around the old man, and then we bolted and hid in a bibimbap restaurant. After our lunch we headed to the festival. We tasted several teas, purchased tea-related paraphernalia, toured around the tea museum and capped the afternoon by dipping our feet into the river to cool down. It was a nice afternoon, although perhaps a bit less interactive than we had expected. The trip home didn’t go a smoothly as we had hoped. We missed our chance to buy a ticket for the direct bus back to Seoul, presumably because they were sold out. So we took a bus from the festival back to Hadong. We then caught another bus to Jinju, where we transferred again to get to Seoul. The ride home was long one, with the total journey taking about seven hours. However, given that we hadn’t planned enough to have a return ticket, it worked out pretty well. Plus, I learned that I really like the names Peggy and Eugene, both are on the shortlist for future fish names. A picture taken from the first of three buses we took to get back to Seoul. 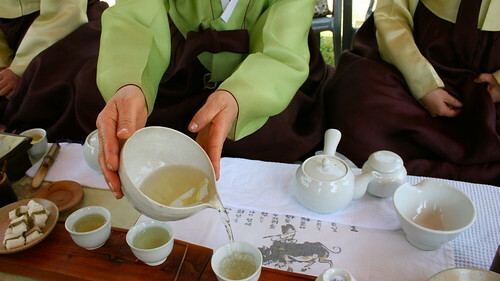 Your tea festival adventure sounds fun! I really enjoyed the updates and am shocked but happy that you actually attended a team sport event and enjoyed it. Great to have the update and I loved the pictures. Enjoy and so glad you are having each of these experiences.